Niloufer we tasted your badam pak. Here is a review from Glam in Adelaide Australia that is shared. Hope all is well. I have to let you know that your recipes are simply wonderful. Prepared an entire Parsee Meal today, picture below. Needless to say Jehangir & Kids enjoyed every bit of the meal. Looking to join in on a cooking session when time permits, do keep the mails coming ! Thank you for putting together such a wonderful recipe book. Thank you so much for your wonderful cook book of our beloved Parsi kitchen... I am very impressed (and immediately hungry) and hope my thanks reach you, as I lost your personal address.. Thank you - and bravo! Not quite a review, but here is one that will share what Parsi Food is all about. Do not hesitate. Just buy and enjoy the recipes in this book. This book is amazing if you like authentic Parsi/Indian food. The recipes are so easy to follow, the end result is absolutely delicious and the pictures themselves are mouth watering. everything explained in very simple terms and no guess work or interpretation required. I would not hesitate to say that it is the very best investment that I have ever made in a cook book. Niloufer has truly excelled in writing this book. Darius Balsara This book is the best culinary investment I have ever made. The recipes are easy and superb in taste. Well done NM. Every single dish is worth trying and relishing. A Must book for all cooking lovers. Parsi Cuisine at its best. Hi Niloufer, how r u all . Ur Badami chicken today was hit at the dining table. Yummy recipe! from The Art of Parsi Cooking. Found on instagram. As we approach the 1st anniversary of the launch here is what I found on face book. Thank you to everyone supporting this cookbook. Another complimentary review, this time from a fellow blogger Tori True of the Chilli and Mint. "On 17th November 2016 we won the .eu web award from EURid and the European Commission. This is an immense honor for us as it means our website is recognized by a governing body of the EU." Professor and Historian James Blake Wiener. Feedback on the book signing at Bombay Street Food Toronto. Zu Bha Niloufer Mavalvala: Thanks for the shout out, but I did nothing.Bombay Street Food is absolutely wonderful. Amreen, Seema, Chef Don and their team of dedicated staff is what makes it a great venue to host all sorts of events from book launches to Saturday morning yoga/zumba. Give it time, and I truly believe BSF will become a cultural hub in the city booked with daily events. Zeebundeh Khaleeli Niloufer, so glad I attended . The food, samplers from your own recipes were excellent. Loved your book. Bombay Street Food you provide both a welcoming and much needed space and lovely food! Pick a review you wish to read on the new cookbook The Art of Parsi Cooking. ;reviving an ancient cuisine. Blogger BundtLust.com continues to review cookbooks worldwide. The Art of Parsi Cooking, reviving an ancient cuisine was lucky enough to be one of her choices! Read the review here. The best review on Amazon so far. Parsi cuisine not only has its distinctive roots in and around the Indian subcontinent but is also renowned for its uniqueness in that region. Though very different to other local foods, it is still much savoured by other indigenous palates. For example, the traditional ‘Dhansak’ - a Sunday lunch feast (where the appetite is often built to the level of famish with chilled shandy or G and T) is the flagship culinary delight where it is not uncommon for many non-Zoroastrians flock to Parsi homes for the sheer gluttonous experience. I was fortunate to browse through one of the earliest published copies of Niloufer Mavalvala’s ‘The Art of Parsi Cooking: Reviving an Ancient Cuisine.’ It is an easy-to-follow array of Parsi recipes. And in its comprehensiveness, similar to what ‘Larousse Gastronomique’ is for French food. This user friendly guide can be of tremendous utility to both the extremely finicky cooking nerds as well as amateurs who enjoy the therapeutic experience of puttering in their kitchen. With so many Parsis whose thousand plus year migration has taken them from the fertile plains of Persia to the costal hamlets of Gujrat and then to metropolitans like Bombay and Karachi, have within the last half century settled in major centres of Europe, North America and Australia. 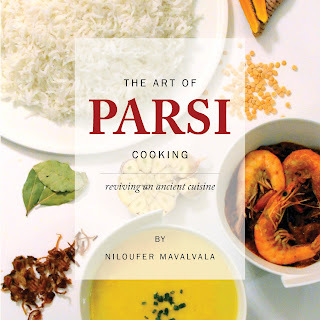 Now thinly spread, “The Art of Parsi Cooking…” will undoubtedly be much in need to follow the traditional Parsi concoctions of “centuries-old ingredients like saffron, jaggery, cider vinegar, ginger, cinnamon and turmeric…” to satisfy those palates that crave Parsi food. Hi Niloufer, Congratulations on the fabulous cook book! Arrived last week and have enjoyed going through it! KK, Sydney Australia. Read another cookbook author and blogger Perinaz Avari from California review The Art of Parsi Cooking; reviving an ancient cuisine. A message via Niloufer's Kitchen FB page. chilliandmintSo excited to start to cooking from #NilouferMavalvala new cook book 'The Art of Parsi Cooking - reviving an ancient cuisine'. ✨Great book launch ✨I particularly enjoyed the khatai biscuits and spiced coriander and cucumber sandwiches. Watch this space for 'masala na khekra - pan fried crabs with spices. June 23, 2016 on twitter. The recipes in this book are so great, I will definitely be making them again next autumn. Tomato soup recipe was easy to follow. And soup turned out excellent. It's a must try recipe. 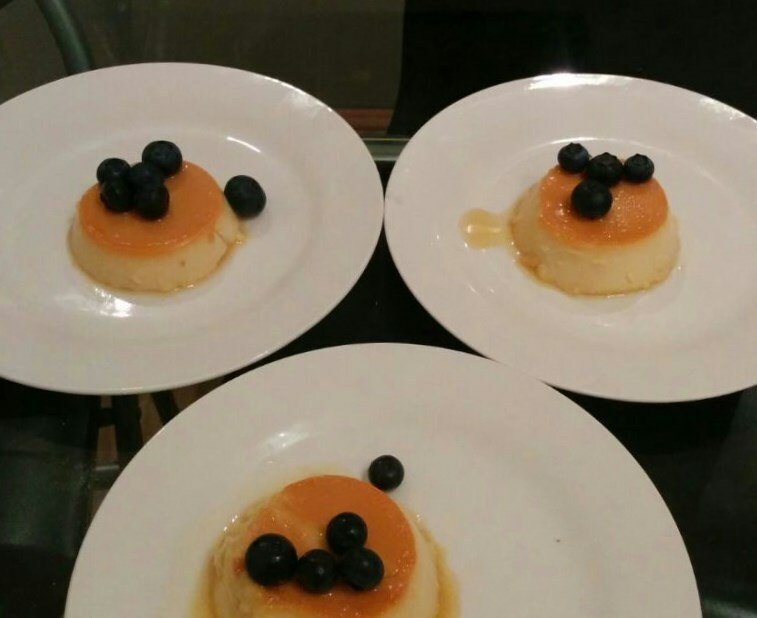 Another yummy success recipe from Niloufer's kitchen. Perfect ! Cauliflower and roasted garlic soup . I think I will serve to my besties at our International movie night at my house. With warm buttered crusty bread. I am always looking for easy Parsi recipes and tried quite a few recipes from here. They are easy to follow and everything tasted great!! Will be getting some more of her Ebooks. Personally I would LOVE a collection of great recipes in a regular cook book!! Just a suggestion Niloufer. The recipes are easy to follow and the result is delicious! Yummy Chicken with Potatoes Parsi style from Niloufer's Kitchen . Thank you for sharing Niloufer, thumbs-up from Farhad. Deelnavaz T.... the chicken and potatoes parsi style. Very good. Will try one day with peanut butter. Thanks for posting recipe. Niloufer’s Kitchen Niloufer offers a beautiful mélange of Parsi, Indian and global recipes on her website, my absolute favorite being her Parsi-style Chicken with Potatoes, which brings back fond memories of my mom’s version. She offers great e-cookbooks which focus on simple recipes. Thanks sooo much! I loved the dhansak and used the Kchi masala! Thank you Niloufer Mavalvala for the fabulous Dhansak recipe. I finally feel I have learned how to make a good Dhansak Cooking Milestone accomplished! Finally made it!! Thanks Niloufer.... it turned out awesome..Didn't have gin or cognac..used white wine instead..
Hello - made the dish yesterday to try it for a party on Saturday - turned out REALLY well. has recommended this book as one of two Regional & International Cooking e-Books. Are you looking for something in our Regional & International Cooking eBooks department? If so, you might be interested in these items. 4.0 out of 5 stars Loved it! Easy to follow and the result was a delicious French Dish. Love the pictures and is truly French cuisine easy to make in your kitchen. I found the recipes very interesting and very reminiscent of "Bistro" i made the Caramel, the Pate, and the Strogonoff! and was very pleased with the outcome! I look forward to trying the rest! Nilufer Mama You will soon have your TV show my dear friend xo wish you continued success. Enjoyed eating your delicious badam paak and relish the marmalade for breakfast. We have frozen the daar nee pori and will eat once my son returns home during the christmas break. Thank you, Niloufer Mavalvala for your lovely XMAS cake recipe! Everyone enjoyed it. The cake turned out soft and irresistible, and the colours were marvellous. Can't wait to bake it again! A perfect recipe from Niloufer's Kitchen..
Dinaz Engineer Have no words Nilufer, you are a Star...you r so talented and such an impressive cook, you always leave me salivating and inspired, but I wish someone would cook fancy things for me, it does happen but rarely....THANK you so much for sharing yr love of all thing culinary with us. Have a super holiday season and an even more creative 2015. Xxxx if I ever come to Canada I am staying with u. Like · Reply · 1 · January 10 at 1:02pm Yeah it was delicious!! Sheeraz Y. Wania and i can vouch that this recipe is amazing the best Sahs ever! Vera Hardwick Hey Niloufer, I made the saas today. It turned out really great!!! Thanks! Mehreen Uneeb Busboosa; My attempt! It's sooo yummy! You should get your work published. Niloufer M, thank you for this most wonderful recipe, your pear tart turned out rich and cinnamony, with the right balance of flavours. I paired it with some finger lime flavoured whipped cream. Great recipe Niloufer. My batasas are a bit "knobbly" but taste YUM! Here is my delicious Ribbon Rice! Thank you very much for the superb Gharab nu Achar. We tasted it this evening with our dinner and we all loved it. It had the authentic flavour that I remember having as a child when Jhinga nu Achar and Gharab nu Achar were commonly had with mora daar-chaawal. Being a co-host in Ozlems Turkish Cookery Class in Weybridge Surrey in the UK on 10th May 2015 was a fun event. Keep blogging and cooking, Tom"
"Niloufer, I must say your Yogurt dip from you book Niloufer's Kitchen: Persian Fusion was the best dish of the class..... Y." "What a sweet note dear Niloufer, most kind, many thanks – it really was a pleasure to meet you and have you in the class – so glad you enjoyed it and we all loved your dip! : ) Hope we can get to enjoy good food again soon. Ozlem Warren"
Vahishta Canteenwalla added 4 new photos. Thanks to Niloufer Mavalvala we had a great Moroccan dinner. Celebrating Maria Westaway's birthday. Niloufer it was all from your book. The fennel and pomegranate salad, the shrimps in the marinade, the chicken tagine and the couscous. Angelita Valenta Yes, indeed it was so tasty delish! I think we finished it all - no leftover! Thanks, V. Another success. Used your Papeta ma Chicken recipe yesterday and it turned out delicious and super fast! Thank you! Made your parsi chicken tonight smile emoticon turned out great… instead of adding potatoes, made sweet potato wedges to go with it. Niloufer, you recipes are not only delicious but Look so pretty too. Thanks! Vahishta Canteenwalla Made your papeta nu gosht. With lamb. Wonderfully delish. Reviews for Niloufer's Kitchen: Spanish Tapas. Dinaz Subjally added 2 new photos. Jaws Kamath Greetings from Nainital, Kumaon.....Thanks Niloufer Mavalvalafor this wonderful recipe....it was really fantastic. Did all that you instructed except the dum part, my final step was in my trusty rice cooker and it turned just perfect. This is definitely going to be on my menu list in the future. Zarrin Dadinatha Made this last week. Easy recipe and very delicious! Thank you Niloufer. Dinaz Nanavaty I tried your Prawn Biryani and came out fab. Niloufer! Your chutney and fish puff pastry recipe turned out awesome... Yet again. Thank you. Tomato soup from Niloufer's Kitchen Soups , got it from Amazon on my kindle , definitely a 10 . Will surely make it again, delicious !!! This was one delicious fish biryani! Thanks Niloufer Mavalvala and Niloufer ' s kitchen for this recipe!! Loved it, and enjoying it !